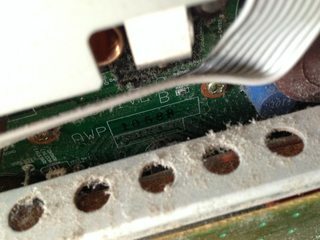 I think this could be a problem with the power suply, because it is making a buzzing sound. Any ideas? I can't watch your video on my phone, but that buzzing you're hearing is probably good old fashioned plasma buzzing. I also thought something was wrong when I first got an old plasma. The buzzing changes pitch/volume based on what's on-screen right? Hopefully this is the appropriate thread for this, if not feel free to zap it. I didn't think starting a whole new thread was appropriate. I have a Panasonic CT-27D11E that I'm using for my consoles. I'm using a Shinybow SCART to Component adapter with it and it seems to work really nice. My only problem is that the picture is tilted a bit and I can't figure out how to fix it. If you look at these pictures you'll see that the left side has a bit of a tilt, but it's not just a normal tilt as the right side shows a different kind of tilt. I entered the Serviceman menu but I didn't see anything to do with geometry controls other than V-Size and centering. I'm no stranger to cracking open the back of the TV (I have it open now actually) but just twisting the yoke a bit isn't going to fix this I think. What kind of adjustment do I need to get this back to a reasonable state? IS there anything I can do? I find this is pretty normal (I would say more often than not and I have a pretty huge number of PVM's which have gone through me) in 20"+ PVM's. In BVM's, no. 14" PVM's, usually no. Maybe not to quite this degree of your pics (unless it's clearly evident the monitor has seen a LOT of use), but it's pretty common to have it there on the sides to some degree (the white slightly shifting over into the red). No fool proof way to fix it (want to say I've played with the rings before, and some older larger sets have a pot which will adjust only one area of the screen at a time), but I'll stay tuned if anybody has suggestions which I can try next time (have ~6x 20" right now I can mess with in fact). Those PDP v402 monitors are realy old and rare. I own CRT's that are newer I bought mine for cheap, so it wont be a big deal if it's impossible to fix it, but it would be great to have one that's fully functional. i picked up a PDP-v402 over the holiday weekend dirt cheap and copy of Thunder Force III. the tv was so old and dirty on the inside. the picture has distortion so i had to open it up and adjust 3 voltage pots due to aging 1st gen panel (dated Feb 2, 2000) and did some cleaning. finally got it up and running last night! I had mine for a long time now, but quite recently there was a seller on local classifieds with a whole dozen. I was very tempted to get a few more (but they weren't this cheap). is it truly lag free? like keeps time with a CRT? a few ms maybe. The linedoubler is working without a full frame buffer. It uses the same doubling algorithm the OSSC uses. wow! 4x i really need a set of those OOS feets/stand for it. I was curious about the set after reading your review, pictured next to it is the 20G1U (which is the same as the 20F1U) that i got too after reading your post years ago! i will eventually get a OLED when prices fall a bit more and my Kuro dies. I have been looking for one for like 5 years now, no luck yet, either seller won't ship, won't ship internationally, or is grossly overpriced (like 800 EUR or so). 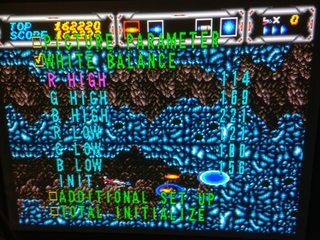 Anyone can help me with this problem on my pal Sony CRT using RGB scart cable at 60htz and 50htz. This not only appears with my Mega Drive console but also with other consoles and especially in light color backgrounds like this blue one. This doesnt appear to be a cable problem because with the same setup on my other crt's everything seems ok.
Edit: It appears at 240p and 480i. Try a high quality CSYNC cable. this remote is a huge back saver to pull up the service menu instead manually constantly reaching for the power and menu located on the side of the TV every time i need to adjust a setting. My back was killing me the first weekend i got the set trying to pull up the service menu. The combination and timing is tricky to get into the service menu. Felt like i'm playing mario and trying to time a perfect jump and while throwing a fireball. The combination and timing is tricky to get into the service menu. do I remember this wrong? Wasn't this one of the easiest combinations ever? In standby just hit menu and within a second hit the power on button? Or am I thinking of something different here? 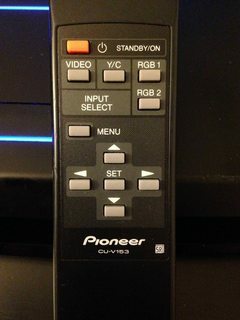 w/o the remote, the buttons are on the lower right side of the panel. it's hard to reach where i stationed the plasma on my floor. it was hard for me as i would hold down the power button too long after releasing the menu button which would nullify the service menu and i would have to power it off and try it again... wait a few seconds for the red light to reset, then hold menu then press power to attempt again. often i miss the timing and have to cycle through this step several times. While in the service menu, if i swap console cables from Genesis Scart cable to Saturn Scart. the Service menu will exit due to a no signal for a split second. Then i would have manually power off the TV and try to get into the service menu again each time. it was a pain while dialing in a good default setting for the vertical and horizontal borders in the service menu. having to switch between consoles back and forth to get a general that spot that works for Saturn, ps1 and Genesis games i was playing. i would then use the regular menu to make fine adjustments to the vertical center. The games i use have extreme shifted borders. I use R-Types psone and shift the horizontal extremely to the left to get the best results that works for the majority of systems. 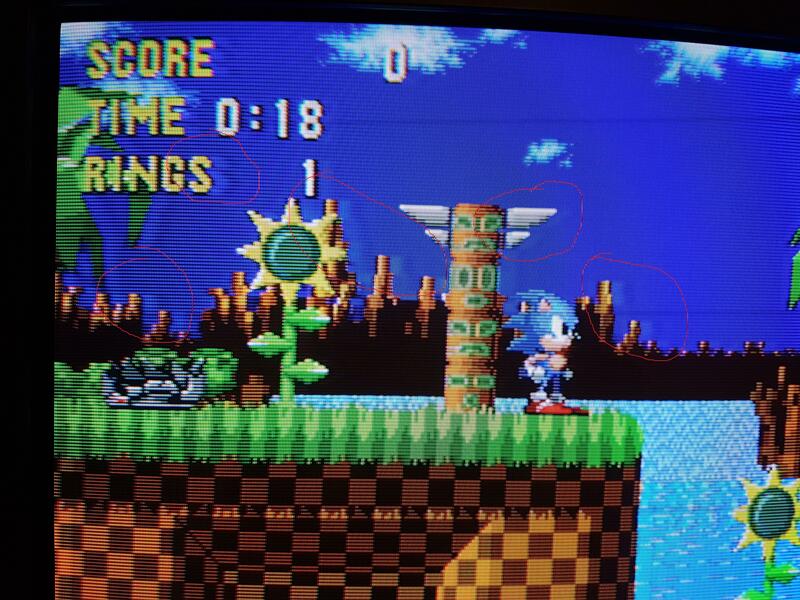 that game needs a good horizontal center dialed to avoid cutting off horizontal cut the top and bottom of the screen. once that is dialed every other system and game usually matches and borders do not get cut off. next, i'll use Resident Evil one psx to get the good shadows w/o crushing the blacks adjusting the RGB LOWS/CUTS vs. brightness and then RGB highs/drives vs. Contrast. Second game, i use is Raiden project in TATE for both I and II. Raiden II similar to R-Types has to be centered perfectly or the sides will be cut off. Raiden I has a lot of wiggle room. After those extreme boarder psone games are dialed in, next i'll boot up the Saturn and use Layer Section TATE, Outrun to check and last, boot up the Genesis w/ Streets of Rage 2, Sonic 1, Out Run and Thunder Force III for fine vertical border adjustments just using the regular menu. Which pots did You have to adjust? I have some issues with mine PDP V402 that I've bought recently, but I have no experience on plasma sets. I also need to open it up and do some cleaning. Do You have any tips? How many working hours is on your monitor? what issue is the panel exhibiting? i just used a dust blower/compressed air on it. mine has close to 20,000 hours on it. This is most visible in the edges of the letters when the menu is displayed. It's less visible while gaming, but still noticible. My monitor has 26k hours on it, so it might be warn out :/ The colours look good though. does that go away after it's been running a while? No, it does not :/ But I didn't use the monitor much. thanks for the youtube clip. i had a different issue with a lot of black and blue spots showing up on the screen and pink sparkles which i was able to resolve adjusting a few voltage pots. 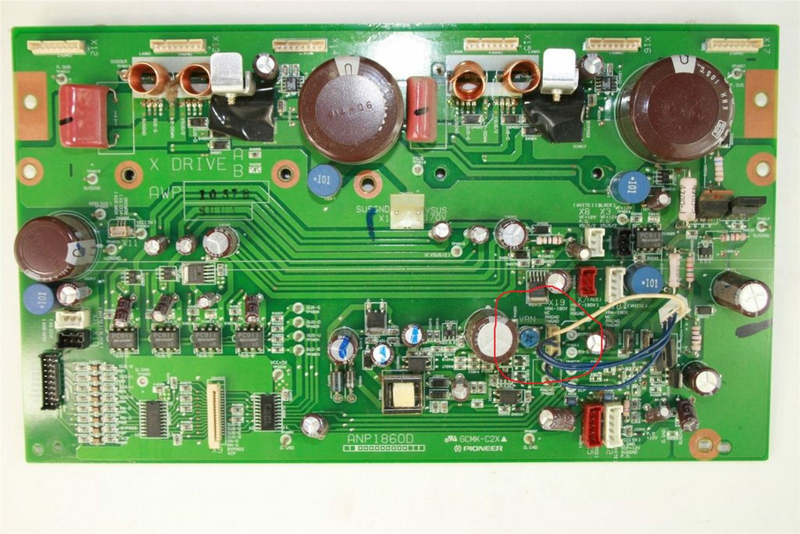 if you have a cheap digital multimeter: check your panel sticker indicating panel voltages that's located right on top of the power supply when you open up the TV. It'll give the proper voltages values the panel was set from the factory. These voltages are essential for plasma picture. Later generation plasma panels as they age have self adjusting voltages. Because this is a first generation plasma panel, as this panel ages, the voltages settings will drift away from values set at factory and may lead to picture issues and you may have to manually adjust them to correct picture issues that may crop up. 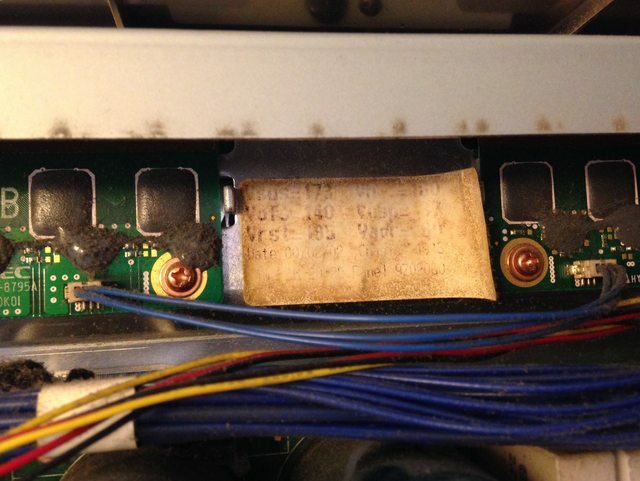 i'm not an expert and this may not be helpful for your case but you should definitely check out Bad caps forums as well. they will be able to answer more specifically if it's unresolvable due to aging or can be adjusted out. I had a few pixels flickering, not as pronounced as your issue, but i was able to adjust out the minor flickering pixels through the voltage pots. 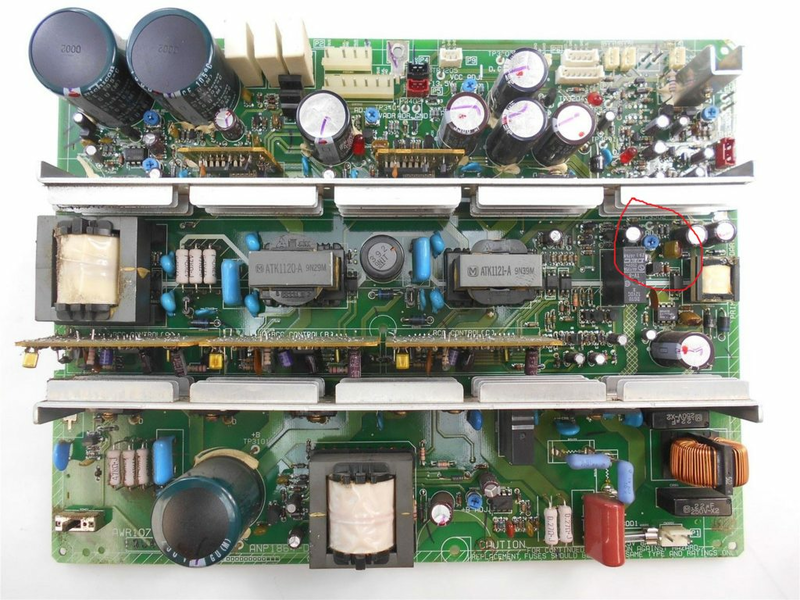 power supply main board is in the center at the top with the voltage sticker right at the top. the pots i needed to adjust were 3.
i circled in RED the pots adjusted in the pics. I have had Sony BVM-20F1E for 2 years and it has been working alright during that time. 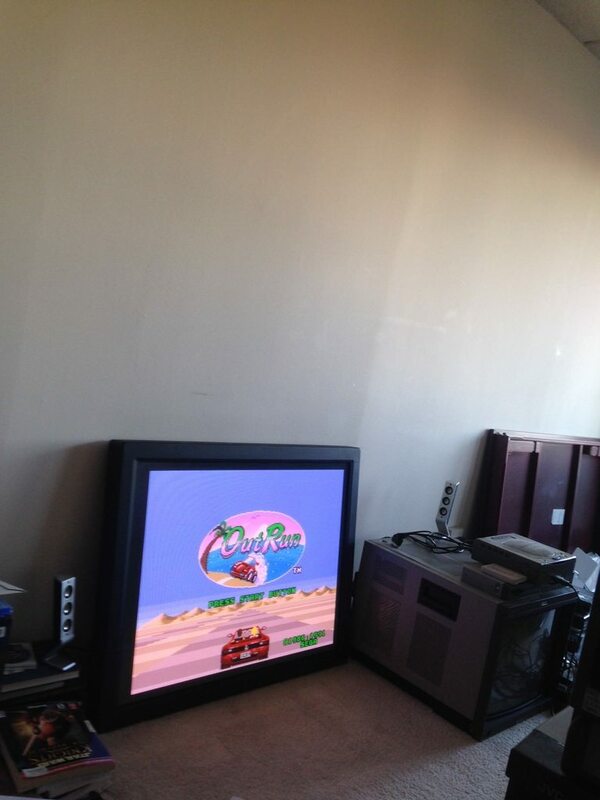 I recently got Sony BVM-D24E1WE to replace it. I'm now in the process of setting it up but was faced with strange problem. BVM-D24 did come with a control unit BKM-10R but no cable for it. I then naturally took the cable from BVM-20F1E's control unit but to my surprise it isn't working at all. No button press does anything and no lights come up. I noticed that when testing same cable and control unit now also with BVM-20F1E for comparison control unit's button lights don't light up there either although control unit works otherwise ok. So maybe that cable hasn't been fully working on that monitor either. I mean from watching some videos in Youtube it looks like that some button lights should turn on when monitor is powered up. So has anyone encountered something similar? Can control unit's cable work with one monitor but not with another? Or could there be something else wrong with BVM-D24? That cable isn't Sony's official one so maybe there lies the problem. Still it seems strange to me that it would work with either monitor. How does the LEDs (overload,standby and Power) on the D24 behave when you turn on the Monitor? are they lit or flashing? In my opinion monitor's LEDs behave quite normally when I turn it on from back switch. I hear degauss sounds and then Standby LED flashes 2 or 3 times. After that screen lights up and it says "Initializing" while Power LED turns solid green. Initializing phase takes few seconds and text disappears from screen. After that I try to press buttons on control unit but nothing works. 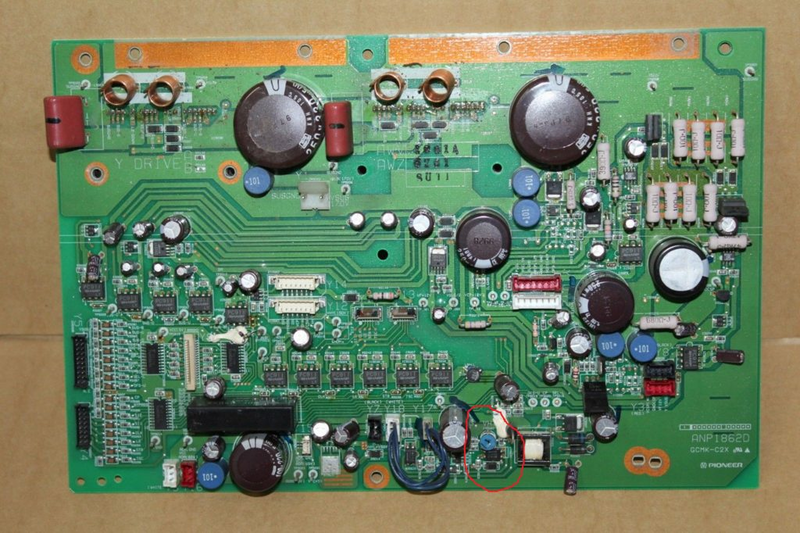 I took out and reseated remote board and BKM 21D board but no change unfortunately. I managed to find generic RS-232 cable locally and control unit started working finally. After few hours testing with different consoles I can say that monitor is working as it should. So in conclusion it actually is possible that one cable somehow works with one monitor but not with other. Bent or loose pins on that cable? Corrosion? Hopefully all relegated to that particular connector and not the monitor/CU themselves. In my experience, some BKM-10r (sony BVM controller) units are finicky about the cables. I ended up buying a second because I could not get the first one I bought to work. I eventually got it working. But it only works with certain cables. The second one is much more promiscuous and hooks up with any old cable I've thrown at her on the first date.